DUJIANGYAN, China — Around 250 B.C., a Chinese official here designed an ingenious system of earthworks that tamed the flood-prone Min River and distributed its water to farmlands. Legend has it that he needed the assistance of a god to complete the task. The waterworks still stand today, guiding the river at the point where it pours down off the Tibetan plateau and into the fertile plains of Sichuan province. Now, they have become one of the key battlegrounds in China’s rethinking of the costs and benefits of its massive dam network. Seeking to control floods and produce clean energy, China’s central planners have presided over a relentless dam-building drive: The country’s 22,000 large dams represent nearly half the world’s total. But growing numbers of Chinese citizens are criticizing the environmental and social upheaval caused by the structures, and many point to the ancient Dujiangyan waterworks as a less-intrusive way to control rivers. Just upstream, environmentalists and sympathetic government officials managed to scuttle a proposed extension of a large dam in 2003, arguing that the project would have diverted water away from the ancient site. Now opponents are turning their attention to a plan to build a series of hydropower plants on a nearby river, the only one in the region that hasn’t yet been dammed. Dams have emerged as one of the few legitimate subjects of vigorous public debate, one that’s testing the limits of the public’s role in shaping policy in this authoritarian country. Beyond Dujiangyan, other proposed dams in places like Tibet have been put on hold, or scaled back, after public outcry. “Times have changed. Engineers need to raise their awareness of environmental protection,” says Lu Youmei, the former head of the embattled Three Gorges dam project and now chairman of the Chinese National Committee on Large Dams, a major dam-engineering organization. In other countries, public debates over dam projects have proved to be turning points in how a society treats environmental issues, says Andrew Mertha, a politics professor at Washington University in St. Louis and author of a forthcoming book on Chinese dams. In the U.S., for example, a 1963 government proposal to build dams on the Colorado River, in the area of the Grand Canyon, unleashed an outpouring of opposition. In 1967, the government abandoned the plan. Many scholars now date the decline of large-scale dam-building in the U.S. to that event. While often touted as a way to provide clean energy and restrain floods, large dams also cause social dislocation, as whole towns are uprooted to make room for their reservoirs. Dams can also result in complex and sometimes unpredictable environmental changes: Stopping a river’s flow changes its ecology and can allow pollutants and silt to accumulate more easily. Nowhere have the costs of dam-building been more visible than at China’s Three Gorges, the world’s largest — and perhaps most notorious — hydropower project. Begun in 1994, the dam forced the migration of millions and led to high unemployment in the region, deadly landslides, pollution and other environmental problems. Many of these problems were predicted by the project’s critics in the 1980s. But those who spoke out against Three Gorges, which had been endorsed by China’s top leaders, often saw their careers suffer as a result. Last September, after years of suppressing criticism, Chinese officials frankly acknowledged a series of problems and said the Three Gorges project could lead to “catastrophe” if its issues aren’t quickly addressed. Government officials had laid the groundwork for that admission with a gradual reconsideration of their dam-building approach. The shift is part of a broader move by the current Chinese leadership to soften a growth-at-all-costs economic philosophy with greater attention to society and the environment. In its latest five-year plan, published last year, the government’s new policy is summed up in the ungainly phrase, “orderly development of hydropower on the basis of ecological protection.” It represents a retreat from the previous slogan, to “actively develop hydropower,” which was essentially a government blessing to any and all dam projects. China isn’t ending its love affair with dams, which have played a central role in Chinese government policy since the Communist Party took power in 1949. The pace of dam building has actually accelerated in recent years as the booming economy has increased demand for the clean electricity that turbines mounted in dams can supply. One hydropower engineer trained in the 1960s, Hu Jintao, is now China’s president. Even many experts critical of individual projects still believe that hydropower is one of the only ways China can meet its energy needs without causing massive pollution. The argument is more over how dams will be built than whether they will be built at all. “This is the most concentrated and most active period of dam building in China’s history,” says Liu Dehong, a former maritime-safety official who this year petitioned the government to slow down the pace of dam construction. Planners need to consider the impact of dams on local people and the environment, he says, to avoid any negative consequences. “We should not have a Great Leap Forward in this area,” Mr. Liu says, referring to China’s disastrous forced industrialization of the 1950s, which led to a famine that killed millions. Some Chinese are particularly protective of Dujiangyan, located in the west of Sichuan province and at the edge of the Tibetan plateau. Every day, tourists stroll through a tree-filled park before coming to a view of a large river splitting in two. That division is the handiwork of Li Bing, an ancient magistrate credited with creating Dujiangyan. Using little more than stone, bamboo and rope, he cleaved the Min River into two channels in such a way that flood waters are automatically diverted. In 2000, plans were finalized for a dam to be built upstream. Although some articles, which appeared mostly in overseas media, warned the dam could harm Dujiangyan, domestic opposition never gathered steam. Construction on the Zipingpu dam began in March 2001, and finished last December. In April 2003, local officials held a large meeting to discuss plans for another dam, which they said was needed to regulate the flow of water from the reservoir at Zipingpu into the Dujiangyan waterworks. By then, Unesco, the United Nation’s cultural arm, had named Dujiangyan a World Heritage site, meaning China would get U.N. help in preserving it for posterity and publicity to boost tourism revenue. This time, the plan sparked an immediate backlash. One major opponent: a new Chinese government bureaucracy created by the Unesco designation and charged with preserving the site’s cultural value. Opponents said the dam would irrevocably damage Li Bing’s ancient design by altering the water flow and would also be close enough to be visible to tourists. The threat of the dam impinging on the heritage site shifted the ground of the debate from technical and environmental issues to the preservation of a national treasure. The cultural officials proved sympathetic, and granted dozens of interviews to the press, helping create a storm of media coverage opposing the project. That led to a surprisingly quick decision to abandon the dam. By August 2003, it was officially suspended. “From the perspective of the local authorities, allowing the public to participate didn’t have a very good result,” says Ai Nanshan, a professor of environmental sciences at Sichuan University. Around that time, Mr. Ai and other academics founded the Chengdu Urban Rivers Association, a nonprofit group that advocates keeping rivers in their natural state and has kept an eye on Dujiangyan. The national environment for dam projects was also beginning to turn. Similar protests over planned dam projects were unfolding elsewhere in Sichuan and in neighboring Yunnan province. Opponents highlighted forced relocation and damage to the environment and spectacular scenery. In Yunnan, they won a suspension of dams planned for the Nu River. In January 2005, the State Environmental Protection Administration responded to the large number of reports of environmental problems with dams. It issued an urgent notice calling attention to problems at many dams and requiring projects to undergo environmental impact assessments. It blamed a surfeit of dams for causing some rivers to run nearly dry. Environmental officials followed up in February 2006 with new rules requiring public comment on the environmental impact of projects, including dams. Yet there is a huge industrial and political establishment devoted to dam construction in China, and critics still face long odds. Dujiangyan’s engineers are now focused on a 28-mile stretch of the Baitiao River, the only one of the six local rivers fed by the ancient waterworks that has not already been built up with dams. 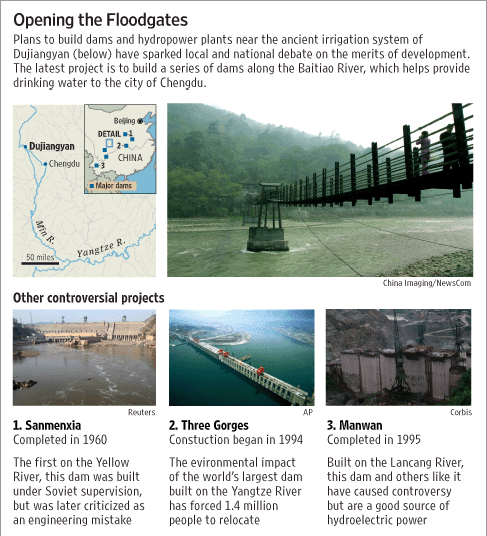 Engineers argue the plan, which would add a whole series of small dams and hydropower plants, would help expand the area Dujiangyan can irrigate by adding modern hydraulic technology. Mr. Ai, of the Chengdu environmental group, says he first learned of the Baitiao River development in April 2006, when one of the group’s volunteers stumbled across a document describing it on a Sichuan government Web site. It was a request for public comment, but the environmental group discovered it just a day before the comment period expired. The scholars swung into action. They sent letters to the government questioning the economic and engineering logic behind the development. Borrowing a page from their last successful campaign, they argued that development could damage a priceless piece of China’s heritage. But this time, opponents are handicapped by the fact that the planned developments are well downstream from the Dujiangyan waterworks itself, and would never be seen by most visitors. Mr. Ai argues that at least one free-flowing river should be preserved in the Dujiangyan area to help maintain the spirit of Li Bing’s original design. “It’s like cutting off your foot. How can that not hurt the rest of your body?” he asks. Others say the planned dams could hurt water quality by making the river stagnant. The river currently helps supply drinking water to roughly 10 million people in and around the city of Chengdu. Dujiangyan officials say they are listening, but want to plunge ahead. “I think we can’t just have opposition every time someone says ‘power plant,'” says Sun Longke, chief engineer of the Dujiangyan Administration Bureau. The Baitiao River project has gone through a thorough impact assessment, he says, and opponents’ fears are unfounded. In August, the leaders of the project met with Mr. Ai and other critics at a Chengdu restaurant, and both sides said the discussion was cordial. The project leaders curbed their plans a bit. The number of planned hydropower stations has been cut to 10 from 15, and a 10-mile segment of the river will be entirely free of dams, Mr. Sun says. A spokeswoman for the Sichuan provincial government said leaders are still looking closely at the project and have not given it final approval. While opponents of the Baitiao River project doubt they will succeed in killing it, they hope they can establish precedents for how China’s government should relate to its people. —Kersten Zhang and Shai Oster contributed to this article.